“We believe in sourcing the best, so you don’t have to worry. We only sell bottles we’re proud of”. This week, we’re uncorking our story of "EXPERTISE". 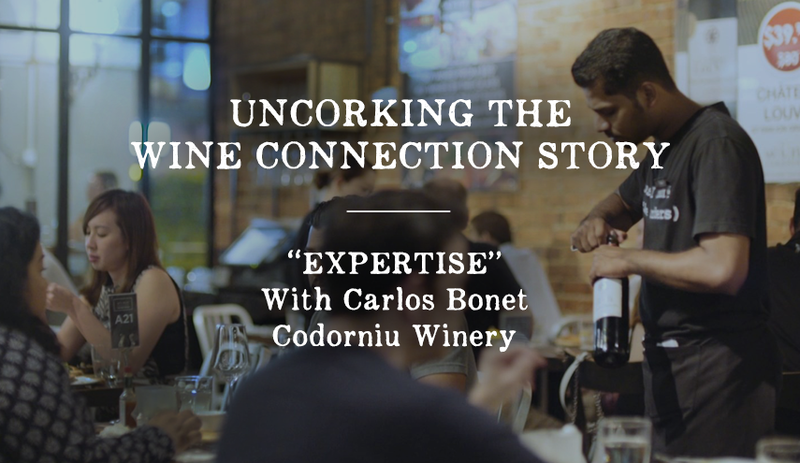 Our brand video features Carlos Bonet, a Regional Sales Manager of Codorniu Asia. The Codorniu Winery that Carlos is from is nestled in the region of Catalonia, just off Barcelona. Codorniu Winery is the oldest winery in the world and the second largest producer of Cava, a bottle-fermented sparkling wine. It was established in 1551 (465 years ago!) and is happily run by the same family of which the owner is part of their 18th generation. we at Wine Connection care about our wines just as much as our customers do. the taste of the wine, but also to appreciate the history and stories through their grape vines. The wine you bring to a dinner party says a lot about yourself. As Carlos explains, you can be the one to buy wine at a great discount or bring that special bottle that you know a brief story behind. A great example is that Reserva Rioja is a wine that the King of Spain himself drinks. Even with limited knowledge it’s more than enough demonstrate that the wine is of quality. At Wine Connection we pick the best wine selections, and through our expertise share our knowledge and experience so customers don’t have to worry. Through the journey of tasting different wines in outlets, to visiting wineries to talk to winemakers and witnessing the procedures, your experience grows and this is where expertise counts! Expertise is important and develops over time. The more you learn about wine, the more you define what you like, the more expertise you get out of it. And as a brand ambassador, Carlos never tells people whether the wine is good or bad, it all comes down to your taste that makes it very personal. As Wine Connection provides you with plentiful opportunities to learn and try, so your expertise will improve in the process. Lastly, Carlos is convinced that Spanish wines are the best value wines in the world. Getting the best selection of wines for the price you pay is something that means just as much to Wine Connection which he loves. So are you ready to be the expert? Shop to discover wines at our online store to kick start your journey or search for a store near you today. Your Wedding Wines Guide Beer Nerd or Wine Connoisseur?